What kind of child bible curriculum is your church using? The Christian Education program resources used in the children's ministry of the past are becoming outdated as church volunteers become more scarce. Those 20% of volunteers who are serving the church by performing 80% of the work may not be gifted in teaching the resources of the past. However the new curriculum resources are tailored to newbies as well as trained teachers. Click here to view some great child bible curriculum choices It seems like just yesterday the Sunday school classroom was small and broken down into age appropriate groups with written lessons a teacher used to interact with his/her students. These Christian education program resources consisted of a watered down lesson with a coloring page and craft. However the new trend that is sweeping the nation is a large group/small group format. Nearly 20% of churches already use this model and 34% more plan to switch soon according to research conducted by Group Publishing,Inc. What is all the excitement over this new curriculum and how does changing child bible curriculum change the dynamics of your program? The reason the new format works is because many kids enjoy the energy and excitement a large group setting instills. The large group meets first, connecting the kids through worship and teaching time which cannot be matched in a small classroom. The Children's ministers and leaders like it because it employs consistency which can easily be monitored. It also allows unlimited creativity, which helps to bring the child bible curriculum to life for the kids. It also allows leaders to inject Christian education program resources into the curriculum which flow with specific cultural dynamics of their church or area. Next, the focus immediately jumps to moving into small group settings where kids connect to one another and apply the truths to their lives. The small groups consist of no more than five children, which gives shyer kids an opportunity to share what they've learned, grow in their relationship with God and feel a sense of belonging or community with their church family and that someone really cares for them. The small group also helps kids put the pieces of the puzzle together. The leader and other children help the kids connect the material they've heard and apply God's word in a relevant way to their lives. Another benefit of the large group/small group model is it allows leaders to truly use the gifting of their volunteers therefore not burning them out. This works because it doesn't require everyone to be articulate and outgoing or play the role of teacher or skilled bible scholar. 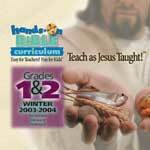 This child bible curriculum allows the leader to pick and choose which roles to fill within the pool of volunteers. Those that have a true gifting of bringing child bible curriculum to life can fill the role of teacher while those who are more pastoral and loving can fill the role of small group leader and apply the children's ministry curriculum to the lives of the kids in their small group. Another advantage of these new Christian education program resources is that it allows leaders to pull together talents from others in the church for quick stints as drama players, greeters or photographers. It's a great way to keep volunteers happily plugged into their gifting while retaining and bringing in new volunteers. All in all the large group/small group format takes some of the headaches away from leaders due to attrition and gives volunteers an opportunity to serve in a position that compliments their gifts and talents. This provides the children with a more energetic and awesome God inspired experience which is always good! If you choose to embrace a change it is very important that as a leader you perform a vision casting of the program to your volunteers and parents. Emphasize how the new child bible curriculum fosters spiritual growth among the children while promoting the fact that volunteers are able to use their gifts and talents which makes them able to perform better with the kids. Some of the publishers utilizing this small group/large group format are Group, Kids Kount and Orbit Church. However with the popularity of this new style, look for other publishers to add this format to their programming. Below is a link to a site that has a wide selection of curriculum produced by different publishers at greatly reduced prices. Another benefit of the large group/small group model is it allows leaders to truly use the gifting of their volunteers therefore not burning them out. This works because it doesn't require everyone to be articulate and outgoing or play the role of teacher or skilled bible scholar. This child bible curriculum allows the leader to pick and choose which roles to fill within the pool of volunteers. Those that have a true gifting of bringing child bible curriculum to life can fill the role of teacher while those who are more pastoral and loving can fill the role of small group leader and apply the children's ministry curriculum to the lives of the kids in their small group. Some of the publishers utilizing this small group/large group format are Group, Kids Kount and Orbit Church. However with the popularity of this new style, look for other publishers to add this format to their programming. Click below to enter a site that has a wide selection of curriculum produced by different publishers at greatly reduced prices.